Welcome to potions class 2! *you must buy the book "Magical Drafts and Potions"...I will check to make sure you have this book! Welcome to potions class 2, my name is Professor Amelia C. Abbot. I am going to teach you about many potions. 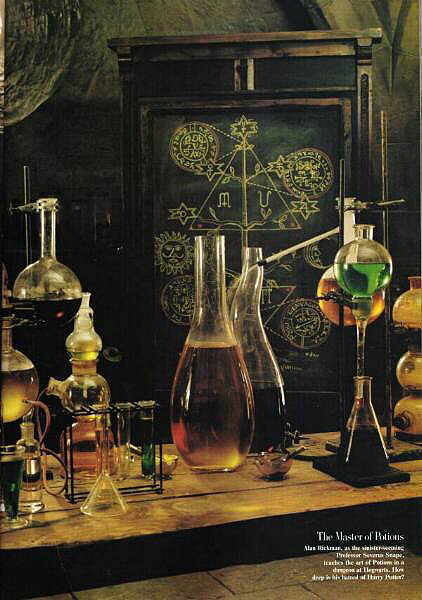 In this class you will learn what many doffernet potions do (such as the Draught of Living Death and Felix Fulicis). Also you will learn how to make some potions, and you will just learn about some potions. If you would like the complete schedule about what you will be learning when..and what..Check out the page called SYLLABUS(coming soon). There will usually recieve homework once every other week. And sometimes I might doextra credit assiments. If you do them and I feel that they are good enough you will earn some points for your team! I will give a test every month. So dont forget anything you learn!! These things will be told to the headmaster. I have to do this wether or not you like it because it a requierment for professors. So do your best on everything. See You September 1st...When the term starts!!! Thank you for joining potions(class 2)!